Find the confidence to go your own way with this medallion inscribed with a thought-provoking quotation. Whether you've always marched to your own drummer or just found your voice, this beautiful necklace by Kathy Bransfield dares you to be different. 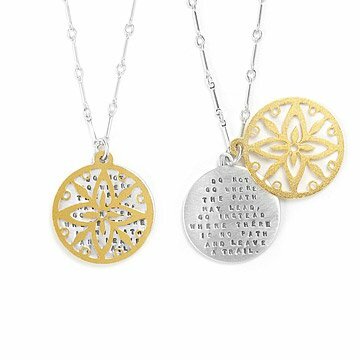 Made from sterling silver and 22kt gold plated brass, this two-piece pendant features a hand stamped quote by Ralph Waldo Emerson as a hidden message for the wearer. Handmade in the USA. I couldn'thave Imagined a more perfect college graduation gift for my grandson's girlfriend, who i'll Be meeting for the first time. I was looking for a necklace with an inspirational message for a graduation gift, and loved the intricate delicacy of the two tone pendant, the half hidden Ralph Waldo Emerson quote, the lovely chain of perfect length, and that it was made in the US. The graduate just loved it, and everyone wanted to know where they could order one. I told them, Uncommon Goods is my go-to place for online shopping. She loved it. That's all I need. This was a beautiful and meaningful gift for my niece's birthday, on the brink of her graduation from college. She loved it! This necklace is as inspirational as it is beautiful. This was a Christmas gift for my daughter. She is a strong young woman who definitely makes her own path. But every once in a while, she will doubt herself - I gave her this to remind her that she is a strong and intelligent young woman and to go with what she feels is right and to make her own path even if she is the only one going that way. Not to doubt herself. I had been searching for a long time for a retirement gift for a wonderful female colleague and friend, without success. I wanted something meaningful, but not cheesy. I was thrilled when I found this. It was perfect, and very well received.